Hockey Canada is the national governing body for grassroots hockey in the country, overseeing the management of programs in Canada from grassroots to high performance teams and competitions, including world championships and the Olympic Winter Games. The brand aims to create and promote positive hockey experiences, and its website serves as a hub for hockey fans to find information about homegrown hockey, international events and much more. In 2012, the Hockey Canada website was rebuilt and relaunched on Agility CMS with the help of implementation partner Point Alliance. When Hockey Canada set out to find a new content management system, the brand’s need for a flexible, secure solution was paramount. After an extensive review of platforms, Hockey Canada landed on Agility CMS to rebuild its online presence because of the platform’s robust capabilities. During large-scale hockey events, fans visit the Hockey Canada website in droves to find game schedules, scores and information about players. Hockey Canada has experienced issues in the past as a result of a previous platform’s inability to handle big spikes in traffic. Heading into an international tournament in early 2014, it was expected that Hockey Canada’s website was going to receive record-breaking amounts of traffic, and Agility needed to be prepared to handle those big numbers to keep the site up and running without any hiccups during peak times. Prior to the tournament, the Agility team analyzed peak traffic spikes from previous years versus CPU usage and site performance. Based on the findings, Agility implemented – with the help of partner Point Alliance – updates to the Hockey Canada site. We put a plan in place to ramp up its hosting environment if the load intensified at any point in time, and we tested many different scenarios. We also created and tested a new caching algorithm to handle new content being published to the live site during traffic spikes. We used load-testing software to find a benchmark of site performance prior to our updates. Then we ran the same tests against the site after our performance updates to see the impact of the changes made. There was a major improvement in Hockey Canada’s performance. Page load times were down by about 90 per cent during peak traffic times, while CPU usage was down by over 60 per cent. 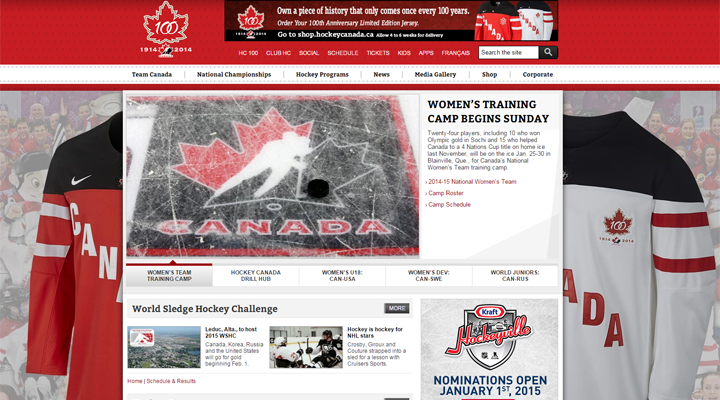 During the tournament, the Hockey Canada site set three new record highs and received page views in the millions. The site was able to handle it every time without a glitch.